SOGS has overseen a number of surveys in order to enhance the overall graduate student life at Western University. 2016 Campus Recreation Grad Student Usage Survey : primary concerns included graduate student usage of the gym and to determine what services graduate students wanted more/exclusive access to moving forward . Conclusion: Many graduate students access the gym, and fairly consistently; majority expressed interest in graduate-specific programming; desire for strengthened partnership between Campus Recreation and SOGS to better promote these services. 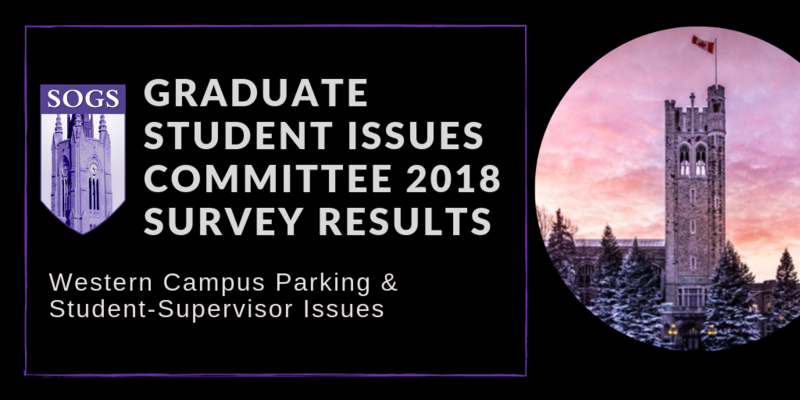 2017-2018 Graduate Student Issues Committee Survey: primary concern was graduate student parking & supervisor issues. Parking on campus is a headache for all students and visitors. For graduate students who commute, work off campus or have to drive children/family members, a lack of available parking spots is problematic. Main campus parking problem for graduate students: Western oversells its parking lot spots, which means spots are not guaranteed. At Western the “student-supervisor relationship” is not well-defined, which means that this relationship varies across campus. Factors of this relationship: A supervisor’s style of mentorship and the student’s willingness to work under that framework. SGPS has a “license” system that limits how many students a professor can mentor, based on tracking: 1) how many of those students graduated on time and 2) how many complaints a faculty member receives from their students. 2018 Grad Club Coffee survey: Results TBA. Primary concerns: 45.7% stated they wished to increase the cost of the Plan to increase the level of coverage; 29.7% reported they did not know they had mental health coverage as part of the Plan; dental, vision, and mental health identified as largest priority to students.